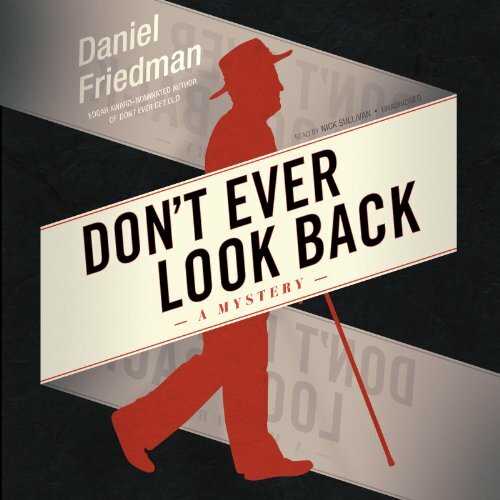 Twentysomething Daniel Friedman's debut hit novel, Don't Ever Get Old, was a huge critical and word-of-mouth success. Now his unforgettable protagonist BuckSchatz is back, and once again this 88-year-old retired Memphis cop refuses to go gently into that good night. Having sustained injuries in Don't Ever Get Old, Buck is living at a retirement home with his wife, and he's downright miserable being treated like the elderly person he is. But soon, Elijah, a man from his past, pays Buck a visit. Elijah offers Buck a tidy sum to do him a favor, and Buck is eager to close the book on a series of robberies that he could never solve. But things soon go downhill - way downhill. Written in Buck's signature voice and featuring a mystery that will knock your socks off, Don't Ever Look Back is another home run by an author with a long and star-studded career ahead of him. I enjoyed the first book as the author hit the sweet spot for Buck making him ornery yet humorous and endearing. In this book, however, I thought Buck came across as simply mean, bordering on sadistic. Thus, the lines intended to be humorous fell flat, and the plentiful swearing came across as vulgar rather than funny. The book also involved an alternating timeline that made the story harder to follow. Finally, the book employs numerous derogatory comments about minorities that, while in context for the time and place depicted, can be offensive to the modern ear, decreasing enjoyment of the narrative. Fighting crime with his walker and his guns. Loved it. I want to listen to this again right now. The story went back and forth between Buck's past and present battles against a master criminal named Elijah. As as always there is lots of violence, shooting and black humor. I laughed out loud near the end when Buck hits Elijah with his walker and Elijah says "What are you going to do next? spit your dentures at me?" The combination of weird situations, bloody violence and humor reminds me of Elmore Leonard and Quentin Tarantino. While this is a good story and who-done-it, it's also a tribute to senior citizens and police officers. My favorite part was its glorious humor. The politically incorrect main character, Buck is a one-of-a-kind old coot that we all know. I highly recommend this and its predecessor Never Grow Old to anyone with a dry sense of humor and an old person in their life...and everyone else as well. Buck Schatz maybe an acquired taste, GREAT to me. Where does Don't Ever Look Back rank among all the audiobooks you’ve listened to so far? I have close to 500 books in my library and I classify by, "will I re-listen to this book or not?" I will listen to the Buck Schatz series again. This is an inane question. If Audible wishes for their listeners to give helpful reviews then ask questions that will illicit such answers. Which character – as performed by Nick Sullivan – was your favorite? Nick Sullivan does an excellent job as a narrator. Note, see above question. Buck frequently made me laugh and laugh and laugh. What a great book. Another adventure for Buck. I missed the involvement of his grandson. Tequila is in this one but not as much. I love the banter and especially the techie talk between them. Again the Jewish culture subtlety in spot on-not too much just the right amount and easily understood. And again so many laugh out loud moments-I know people were looking at funny, seemingly laughing at nothing. Again to the author: Buck could not have been quiet for 30 + years since retiring, no way. You better write a couple of prequels for us! The Buck Schatz books by Daniel Friedman are two of my all-time favorites on Audible. Great character, really funny, interesting plot and setting. I hope he writes more.